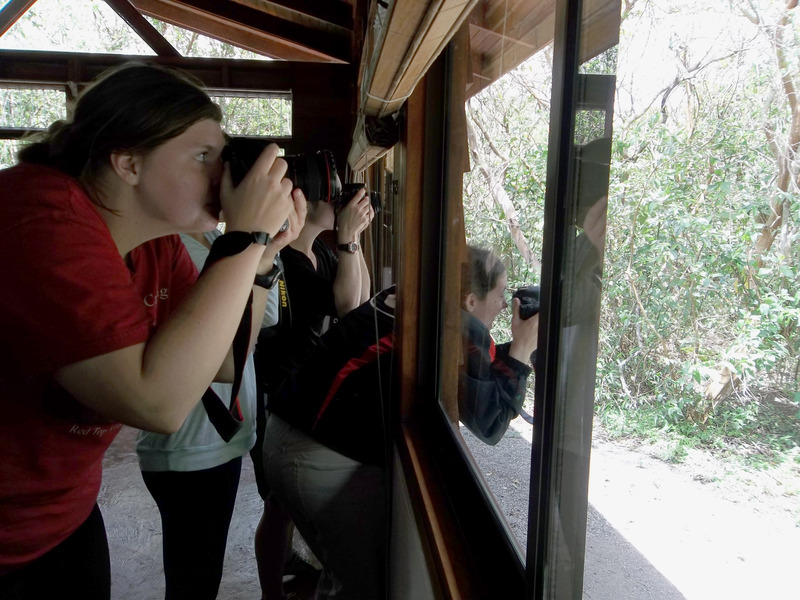 During their Maymester class, students from Dr. Andy Kavoori’s Environmental Journalism class recorded and reflected on experiences such as seeing strangler figs and eating local food. 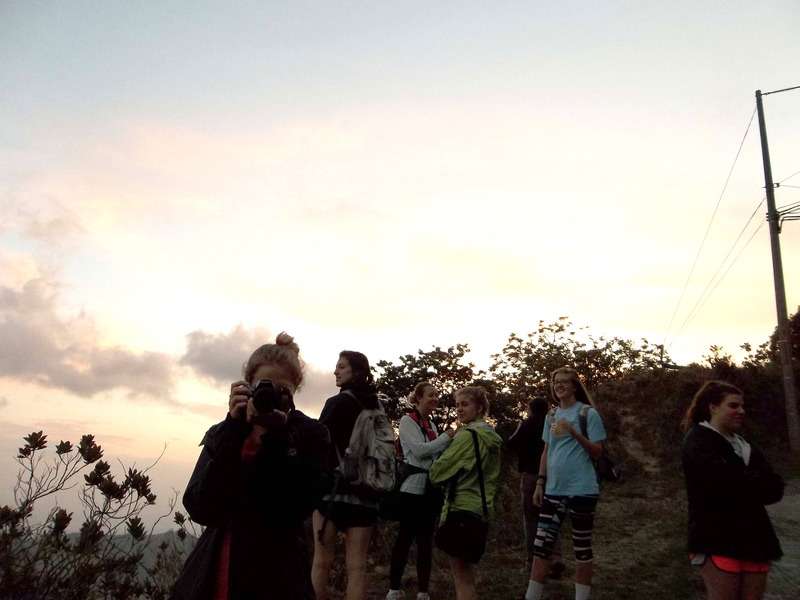 We welcome their voices to our blog and hope their words and photos provide a window into the learning experience and daily life at UGA Costa Rica. In addition to these blog posts, the students have created a short documentary on the culture of food on campus, which will be featured in the coming weeks. Typically when people think of beans and rice, they think of the bland black beans served with overcooked brown rice that garnishes their favorite taco or burrito from a Mexican restaurant in los Estados Unidos. However, Costa Rican cuisine has completely rethought the idea of rice and beans—turning it, if you will, into a new paradigm of usability (with every meal), a side dish (to accompany different main dishes) and of course, if you must as a garnish for your burrito. In sum, Gallo Pinto (Rice and Beans) is the foundation of Costa Rican food. At the UGA Costa Rica campus, I learnt this through the first week of our stay. For breakfast, Gallo Pinto is often served with fried or scrambled eggs, fresh fruit, and patacones (fried plantains). Gallo Pinto can also be topped with sour cream or Salsa Lizano (a slightly spicy, sweet salsa). The Gallo Pinto served at the Costa Rica campus is fresh and flavorful, all its ingredients being locally (and organically) grown. When you take a spoonful of Gallo Pinto, the dark, somewhat bitter taste of the black beans mingles with the mildly fragrant and muted spice of the flavored rice. The Gallo Pinto has often mixed into it green peppers and cilantro, which add a refreshing coolness to the warm dish. Needless to mention that it’s a great source of fiber—and if you eat enough at breakfast, you’ll have enough energy to keep you full until lunchtime. After a week’s stay, I learnt how flexible was Gallo Pinto. It can be served as a side dish (or mixed in) with Pollo (chicken), Camarones (shrimp), Mariscos (assorted seafood), or fried fish (tilapia). When served in this manner, Gallo Pinto is meant to be eaten at lunchtime or dinnertime. The dish can also be served with other Costa Rican food staples such as Ceviche and fresh vegetables. Gallo Pinto can also be mashed to intensify the flavor of the beans and give it a nice thick, creamy texture. When mashed, the black beans emit a smokey smell and flavor that lingers in your mouth like a piece of barbecue and even has a creamy, sweet thickness of barbecue sauce. When eaten with fried rice and fried tilapia the salty, crunch from the tilapia and the curry-like flavor of the rice combine for a unique “kick” that I’ve not tasted in any other dish. After a week, I am a convert. It’s Gallo Pinto from here on. However, I have a feeling that I’ve been spoiled and will not be able to return to my not-so-favorite Mexican restaurant back home. The University of Georgia Costa Rica campus has a botanical garden that is home to over 80 different medicinal plants. These plants have been used by Costa Ricans for generations to treat ailments such as headaches, asthma and gastrointestinal problems. With an abundance of these plants in the rain forest that surrounds UGA Costa Rica’s campus I chose to highlight some of these known medicinal plants and what they are used for. The photos below represent only a small selection of the medicinal plants highlighted in the campus’ botanical garden. Acnistus arborescens is the scientific name for a plant commonly known as acnistus. The plant has been known to be used externally only for treatment of dandruff and eczema. To treat dandruff, Costa Ricans would wash their hair with the sap of the plant for 15-20 minutes. In Spanish, artemisia absinthium is commonly known as ajenjo, but we know it as wormwood in English. The leaves of wormwood are normally used in a tea to treat indigestion, stomach parasites, menstrual pains and to combat liver and gastrointestinal problems. It can also act as an anti-inflammatory or antiseptic cleanser for skin injuries. Annatto, or bixa orellana, is high in beta-carotene and is normally used as a paste to create dyes and food coloring. Annatto can be brewed as a tea that can be used to treat dandruff, hair loss and headaches. The tea from annatto has also been reported to have a tonic effect on the kidneys and an aphrodiasiac. Reina de la noche (queen of the night) is the Costa Rican name for brugmansia suaveolens. The English name is angel’s trumpet. While this plant is medicinal, it is toxic if ingested. The angel’s trumpet has been known to be used externally as an anesthetic, especially for headaches, pain in the kidneys and pain from the sciatic nerve. Costa Ricans have also planted the trees outside of their homes because the pollen is thought to help people get a better night’s sleep. Echinacea, or Echinacea purpuria, was originally used by the indigenous tribes of the mid-western plains in North America. They used it as an emergency remedy for a lot of illness since it is tonic and blood-purifying. Echinacea is commonly used for the treatment of colds, flu, coughs, sinus problems, fevers, infections, immune-response deficiencies, venomous snakebites, arthritis and rheumatism. Hamelia patens, known as redhead in English, is used on the skin for problems such as sores, bruises, rashes, itches, insect bites, burns or cuts. As of 2006, research showed that redhead contained the properties of antibacterials and antifungals. It also displayed analgesic activity. A tea made from the leaves of momordica charantia has been used externally by Costa Ricans to treat skin infections. Commonly, a tea from the leaves of momordica charantia is used to alleviate problems with the liver and pancreas. Jackass bitters is the common English name for neurolaena lobata. A tea made from this plant is mainly used to fight diarrhea, stomach aches and stomach parasites, but can also be applied to the skin to treat problems such as allergic reactions and mange. Stachytarpheta jamaicensis is a plant native to the Caribbean. Its original use was to consume fresh leaves to battle asthma or stomach ulcers by purifying the blood. This plant has been thought to lower blood pressure. In studies done with rabbits, tea brewed from the plant showed signs of lowered blood pressure. Wandering Jew is the common name for zebrina pendula. This plant is used to help kidney pains, colitis, diabetes and stop hemorrhaging in the form of a tea. The wandering jew plant is known as cucaracha in Spanish. Then: Disheveled, I roll out of bed and trudge downstairs to make myself breakfast. Still half asleep, I reach into the refrigerator for a carton of orange juice and a couple of eggs to scramble. The chill refrigerator air reeks of last night’s Chinese food and I slam the door shut thinking to myself that I’ll deal with the smell later. After breakfast, I decide to take a hot, twenty-minute shower and continue my morning routine by blow-drying my hair while listening to the muffled radio drone on in the background. Now: My mornings in Costa Rica are different. They do not consist of long showers, processed food from around the globe, wasted water and electricity and most definitely not leftover Chinese food. Mornings instead consist of a five minute shower, organic and local food, and a focus on sustainability. The transformation began with Fabricio—the general manager for UGA Costa Rica. My first encounter with Fabricio was during an uphill hike in the drizzly rain to the organic garden. I was surprised to see another person on the seemingly deserted trail. As we passed, I managed to gabble a simple “Hola. ¿Cómo estás?” between my heavy breathing. With a friendly demeanor, he introduced himself as Fabricio and flashed me a smile—he must have met many a huffing puffing student toiling up this hill. After another steep incline I reached the farm. Rows of lettuce, carrots, tomatoes, oranges, and cuadrados filled the garden and surrounding trees in abundance. These vibrant rows of natural food overlooked a lush cloud forest composed of endless shades of tranquil greens. I glanced and noticed a familiar face: it was Fabricio. Somehow he had appeared at the farm before me. He stood up, basket of lettuce in hand to speak with me. With an open manner and undeniable charisma, he spoke of his love of Costa Rica, the Earth and above all, sustainability. So, what exactly does it mean to live sustainably? For Fabricio, it means eating locally, educating the community, and speaking out for the environment. Listening to him, I realized that for me, the overarching definition of sustainability means taking as little from the Earth as possible. It means leaving as small a footprint as you can. The question is, how can we change our long-set ways of living that we have grown accustomed to? I learned a new word in class at Costa Rica. That word is “metanoia.” It means the transformation of one’s whole being: fundamentally, a change in one’s paradigm. We all need to have our own change of heart, or metanioa to be fully successful in protecting our planet. I hear Fabricio calling from behind a tree. He offers me cuadrados and carrots that I gratefully accept and enjoyed as I descend back down the trail toward campus: my stomach full and my mind beginning a new journey. On a dirt road, after driving for under an hour, our bus rolls into Santa Elena, a small town in the Monteverde forest of Costa Rica. Here is what I find: A pizzeria, an enormous souvenir shop, and a multitude of signs offering tours of “authentic” nature in Costa Rica. I also find that I can get free Wi-Fi. Duly noted. 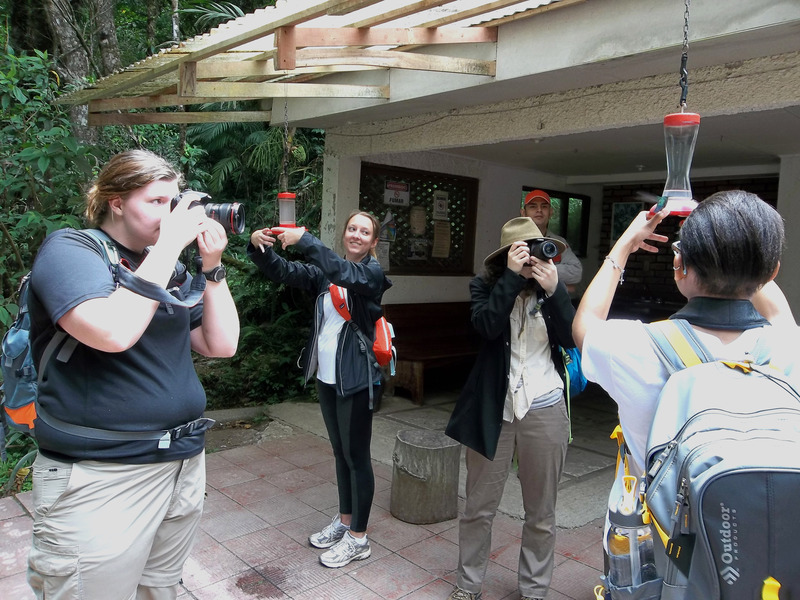 Ecotourism is defined as “a form of tourism involving visiting fragile, pristine, and relatively undisturbed natural areas, intended as a low-impact and often small scale alternative to standard commercial (mass) tourism”. Being an eco-tourist is surprisingly easy here, almost as if the town was made to cater to us. Which of course it is. 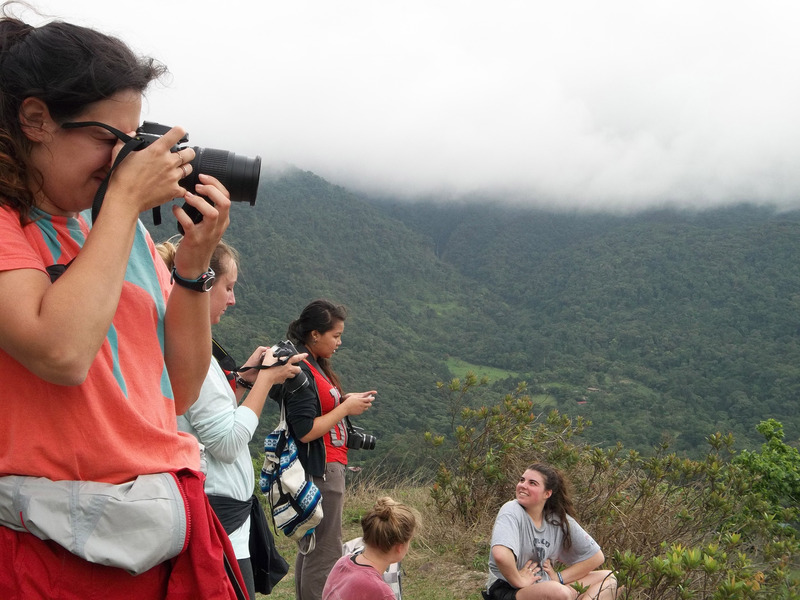 Santa Elena is in the middle of a huge nature reserve that draws in thousands of visitors every year. What I am drawn to however is the underlying question—what does it really mean to be an eco-tourist? People, myself included, come to these places, these enclaves of the natural world, with the hope of finding unity with nature, of helping to preserve one of the last pristine places on Earth. Pristine. That’s an interesting word. What does it mean? Certainly, it must have something to do with being untainted by the material world. But are they? I spent all day with a camera glued to my face hoping to take in all that I could and maybe bring a few souvenirs home to mom. Wasn’t I just consuming nature? And what’s the problem with that? I’m not a corporation, storming in, guns blazing with plans to bulldoze Santa Elena and the surrounding Monteverde region in order to build a few shiny, new skyscrapers and maybe a twenty-story apartment complex to match. But it’s still worrying. While my impact may not be as damaging to Santa Elena as that, it is still palpable. The young children I encounter serve as a barometer of this confusion. Their parents know exactly what we’re here for, but the children looked at me in puzzlement. I sense mistrust in their eyes. To them I must have looked foolish, walking around, mouth agape, taking pictures of everything I could, from shrubs to signs to something as simple as a door to the market. Because to me it isn’t just a market, it’s an authentic, Costa Rican market with none of the trapping of the huge corporate chains in America. And then it becomes obvious to me what’s wrong with this whole set up. The markets in Santa Elena and the ones I see every day in the states have one major thing in common: commodification. Materialism did not disappear when we arrived in this nature outpost in Costa Rica. Rather we brought it with us, turning nature into a product to be bought, sold, and consumed. Am I a tacit participant in the very process I came here to avoid? Does the arrival of ecotourists in these places do more harm than help? After all, who needs Wi-Fi, “authentic” pizzerias, and souvenir tourist traps in a town whose simplicity is its main draw? Apparently we do. And as long as tourism is the main source of income for these small towns, they will deliver, cementing them as a part of the contradiction that is at the heart of their survival. As our bus rolls out of Santa Elena, I wonder if I will return—and if I do, will I be able to enjoy it, knowing that I too am part of the contradiction. Kaitlyn McManus We have fallen victim to something here in Costa Rica, and we had only been out of the airport for a few minutes. Let’s take a photo. Of everything. I think it is the sheer number of pictures being taken is what got me interested in the fact that we spend so much time looking through the lens of our cameras. I certainly am not immune to the lure of getting that perfect picture, and you can see that I got caught taking pictures of people taking pictures in order to see what I might learn. It is increasingly easy to share pictures, but I have found that we are all stopping at the same spot on the hiking trails to get the same shot. It seems like we have to be the one to take the picture. This experience of taking the picture is deceptively simple because our cameras create enough distance so that you can have interaction without having to fully engage and invest your time. I love the fact that I got to see this stick bug up close, but would I have picked it up and gotten even closer? One day our tour guide mentioned that you could take a photo through the telescope, and suddenly there was a line of people with their phones out. It was a little disheartening because everyone was so focused on waiting in line to get a picture, and they were missing out on all of the nature right at their fingertips. Somehow capturing the moment has become more important than the actual experience itself. It happened again in the middle of class one day when someone had spotted some birds near the windows. Out came the cameras, and the lesson was quickly set aside. You can see how much I haven’t learned about the wildlife this way when you consider the fact that I don’t remember what type of bird it was, but I remember taking a picture. That is not to say that pictures cannot be an integral part of learning if used intentionally. These students are collecting photos right outside of the organic farm as they prepare a documentary about sustainability and food production. It is an appropriate use of the technology in that it deepens our understanding of the environment. As students we have more open minds as far as what we expect to see and what we think we know. One student has gone out of his way off the path to get a good photo, and it is important that we do not limit ourselves to only taking pictures that are picture-perfect. We are so used to seeing idealized images of certain wildlife or locations that there is often a disconnection between what we expect and what we see in reality. However, sometimes you end up in a place and your expectations were completely blown away. I have found that we take pictures as a way to try and process something that is larger than life, like this view after we hiked up a mountain. When you can capture special moments on film you have an opportunity to share your love of nature with everyone, especially those who were not lucky enough to be there with you when it happened. 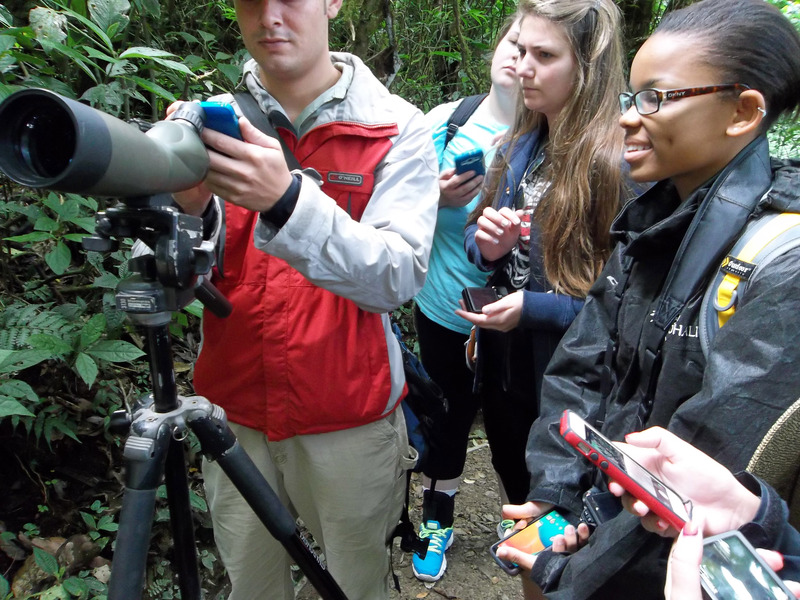 Here you can see that everyone has stopped to watch the tiny hummingbird that has perched on this student’s hand. 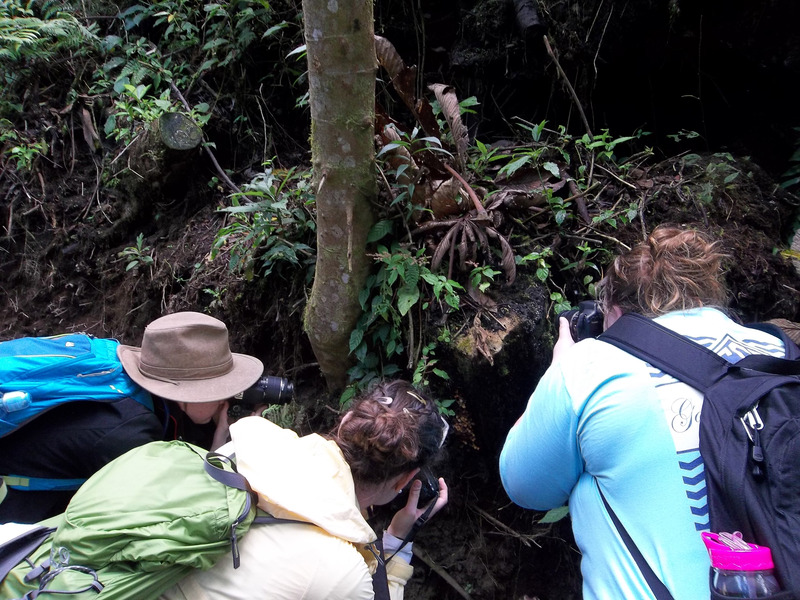 One of our tour guides is pointing out a tarantula in its nest, and we are all shining a light into it’s home to get a good look. The more I think about our insatiable need for pictures, I would ask that we consider if it is important enough to encroach upon the wildlife and create a spectacle out of something just because of our desire to get a photograph. People have traveled before without a camera, and I could almost guarantee that they spent more time living in the moment than we do living through our pictures.